Make sure to get 2019 off to a great start by joining us at the ETAG Annual Conference! There’s no doubt that Edinburgh’s tourism sector is doing well, attracting record numbers of visitors and visitor spend, but there are challenges looming and we want to help you be ready to for them, so the 2019 Conference theme is “Facing the Future”. We’ll bring you a great line up of speakers who will share their knowledge, expertise and insights into the current hot topics and longer term issues, alongside global challenges and local solutions, all with a view to ensuring that your business thrives and Edinburgh continues to lead the way as a world class tourism destination. 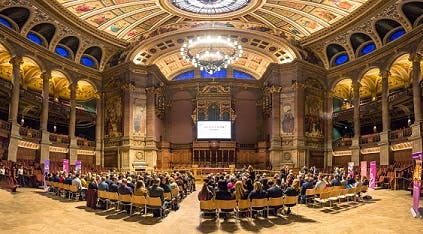 As always we listen to your comments, so we’ll be back in the stunning and inspiring McEwan Hall (but we’ll turn the heating up!) and offering the opportunity for you to bring along a “Rising Star*” from your organisation at the super value price of £20. We are delighted that Lothian Buses will once again be supporting the ETAG Conference and all delegates will receive a free Adult DAYticket, valid on buses and trams. Please note that this event will be filmed/photographed. *One Rising Star place can be booked for £20 with every full price registration. Places are limited and to qualify, the delegate must be 26 or under and a full time employee. More information available via the registration page. ETAG events are aimed at tourism businesses within Edinburgh who operate on a B2C (Business to Consumer) or B2B (Business to Business) basis – unfortunately we can’t offer place to intermediaries, consultants or suppliers of services.